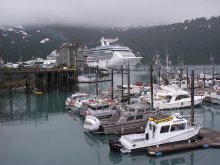 This photo album and review is from a cruise that I took on the Coral Princess, sailing southbound from Whittier, Alaska to Vancouver, British Columbia. 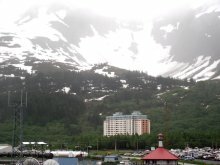 We left Whittier on June 19th, 2010, and docked at Vancouver on the 26th after visiting Hubbard Glacier, Glacier Bay, Skagway, Juneau and Ketchikan. 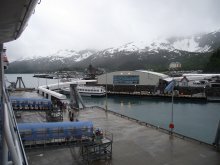 I only took one major excursion during the cruise, a Misty Fjords flight at Ketchikan. After editing, I have 731 photos in my trip file, shot with a Fujifilm S1800 - 125 of them have been posted in this journal. 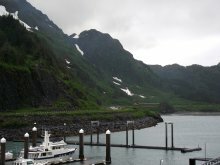 Saturday, June 19: Whittier, Alaska - this is Day 8 for the folks who are disembarking the northbound Coral Princess, and Day 1 for those starting their southbound sailing. 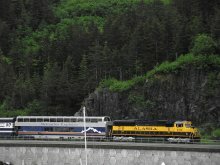 Many of those I'd spent the last week with are now going on tours of interior Alaska, a few are going back south on the ship with me, and about 2,200 new people are boarding. 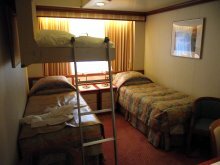 This sailing is completely sold out, as was the northbound - the ship holds 1,970 people with double occupancy but there are many families with triples and quads on this sailing. I talked to Cathy (my wife) on the phone for a few minutes today. I hadn't realized that she's been following along on the ship's bridgecam - seeing exactly what I'm seeing during my bridge time. 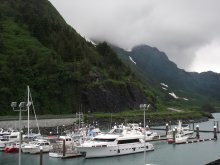 For Anchorage-area residents, Whittier is the gateway to Prince William Sound, and there are hundreds of boats moored here. 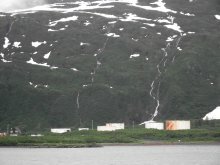 This view is looking towards the tunnel that allows both rail and road access. 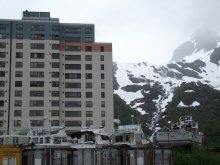 Most of the 180-odd permanent residents of Whittier live in this one building. 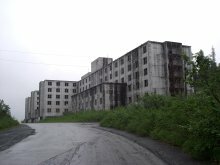 The newest hotel in town, and in the background a huge former military building that's been abandoned for decades. The population of Whittier now is about 1/8th of what it was in its heyday. It always amazes me how fast the ship can be emptied of people and re-filled. I took advantage of open doors during the mass cleaning to have a look at some other cabin configurations - this Oceanview is ready for 3 people to arrive. A few other passengers were also doing back-to-back cruises and we all had to meet at 10:00am to disembark and re-board the ship, though only on paper (I've scanned and posted the "In Transit" paperwork). 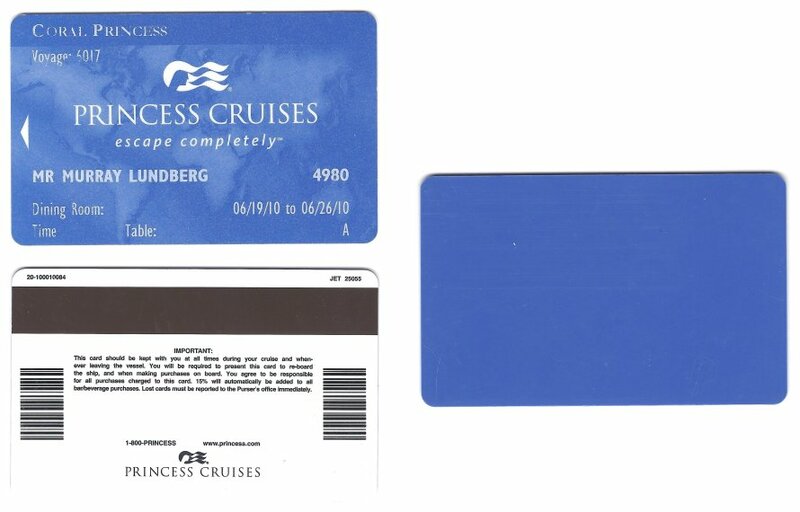 This simple process activated the new Cruise card for Voyage 6017 - it was delivered to my cabin last night. I then continued my exploration of the nearly-empty ship. 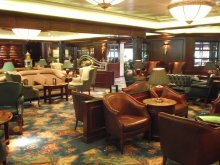 There are some really nice bars and lounges on the Coral Princess - this is the Wheelhouse Bar on Deck 7. 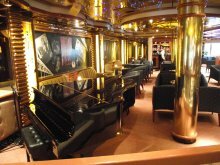 Crooners Lounge, also on Deck 7. Here comes another trainload of new people for the ship. 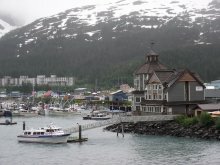 I went for a long exploratory walk around Whittier mid-day, for the first time in many years. I got lucky and the rain held off until I was almost back to the ship. A closer look at the Buckner Building, with a thundering waterfall close behind. I spent an hour on the bridge tonight after we sailed, and went to my cabin at 10:45 pm. 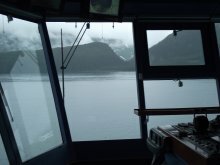 We were crossing the heart of Prince William Sound at the time - Valdez was hidden behind some islands that I could see out my porthole (it was raining but still bright daylight, of course).